The Goddess makes her faithful reentry in the upcoming, and appropriately named, Final Fantasy XIII-2 sequel, Lightning Returns: Final Fantasy XIII. With juicy tidbits of information coming forth from both Square-Enix’s 25th Final Fantasy Anniversary celebration from last weekend and interviews found on Famitsu, the least that can be said about the upcoming conclusion to the Final Fantasy XIII trilogy is that it’ll be like no other Final Fantasy installment. During the presentation of Lightning Returns, Square-Enix focused on two core aspects of the sequel: Lightning Returns’ world-driven gameplay and Lightning herself and how the battle system will affect her. To brief those who may have not played Final Fantasy XIII-2, Lightning Returns takes place hundreds of years after the events that surprisingly ended Final Fantasy XIII-2. Lightning, awakening from crystal stasis after her epic battle against Caius Ballad (this battle is part of “Requiem of the Goddess,”) finds herself in a new world very much different from the one she abandoned. The ground of which she treads on is no longer referred to as Pulsan, but is now what is now known as Novus Partus which, translated from Latin, means “new offspring." Despite being attributed a blessed name, Novus Partus is anything but good fortuned. Lightning, as she wished, discovers she woke up from her slumber as the world was coming to its end, 13 days before its end (a mirror of Final Fantasy XIII which took place during the first 13 days of the trilogy.) Surrounded by seas of Chaos, the force that consumed Gran Pulse when the gates of Valhalla opened, Novus Partus is nothing more than an island with diverse climates spread across notable regions. Novus Partus is devoid of time. People cease to age, plants refuse to die, and, in essence, the power of Chaos effectively ended the flow of time. In the skies endlessly lingering above Novus Partus exists what seems to be New Cocoon, possibly a mutated version of Hope Estheim’s Bhunivelze. Etro's Shrine can be seen far in the distance from the only Novus Partus city of Luxerion. 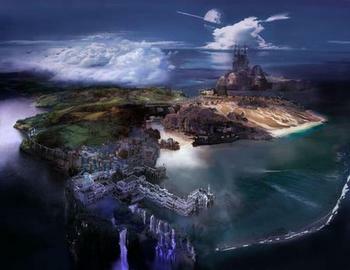 The world of Novus Partus is particularly unique in comparison of other world environments found in the Final Fantasy franchise and, as always, Square-Enix is experimenting with a broad array of new Role Playing Game (RPG) elements. Weaving never before seen tapestry is Lightning Returns’ world-driven gameplay which, unlike the previous Final Fantasy XIII and XIII-2 games, will introduce fresh elements of interactivity with Non-Playable Characters (NPC), game events, monster battles, and even exploration. Albeit being a timeless world, Novus Partus will change as time ticks by. The now mutated monsters which will, for the most part, lack extreme aesthetical similarity to those found in previous Final Fantasy XIII installments vary on terms of what time of the day it is. Certain areas in villages and towns will become accessible during certain times of the day. A monorail system that connects certain region of Novus Partus together runs on a schedule according to what time it is on the game. Time, in case it were not blatantly stated, will be both an ally and enemy. Idling is discouraged and decision making is ever so important as the NPCs that Lightning helps can both extend or reduce game time for Lightning Returns’ “Doomsday Clock,” a reintroduced RPG element. The Doomsday Clock, similar to clock in the popular and memorable “Majora’s Mask,” quite literally will end the game should it click to zero from its starting position, 13. Aside from quests and in-game events affecting its incessant flow, monster battles, items, monorail travel, and the like will affect the Doomdays Clock in both beneficial and detrimental ways. Naturally the Doomsday Clock will tick a day closer to doomsday for every one to two hour interval of real-world time making side quests much more important than ever before in the Final Fantasy franchise. The world of Novus Partus includes only but a percentage of the changes to be found in Lightning Returns. Lightning will meet plenty of changes herself alongside many core gameplay changes. No longer donning the divinely beautiful and mystical armor she was gifted, Lightning will choose a more rugged look more reminiscent to her repertoire in Final Fantasy XIII. However, unlike Final Fantasy XIII, Lightning is able to swap costumes that bear more purpose than modifying her appearance. Certain suits of armor will endow Lightning with special effects while others may withhold other functions. There is to be at least 20 costumes for Lightning in Lightning Returns. The base gameplay will differ tremendously from any Final Fantasy installment as Lightning moves freely on the battlefield, and by herself mind you. Lightning will be the only playable character in the game due to the fact that Square-Enix’s new battle system is suited to revolve around one character during battle. Losing the shackles of the traditional RPG menu screen, Lightning will be able to take cover, issue commands, parry, attack, and counter-attack on the go. The Active Time Battle (ATB) system is still to be present, but will work much differently than it once had. The specifics of the new battle system are still sketchy at the moment, but the ATB system may work in coordination with Lightning similar to the Gestalt System found in Final Fantasy XIII whilst commanding Eidolins. Certain commands can be issued to Lightning which will consume ATB gauge energy as she pieces together her attacks and magical blows to her enemies. It may even possible to perform combos considering the new battle system is to be allegedly unrestricted. Additionally commands issued during battle could have an effect on the Doomsday Clock. Quick Time events may also reappear in their usual fashion as seen in Final Fantasy XIII-2, but may also redebut in an other fashion during special battles. Other details lay in Lightning Returns progress and other miscellaneous bits of information. Square-Enix assures a 2013 release date for the Xbox 360 and PS3 Final Fantasy XIII-2 sequel and that Lightning Returns is currently 30% into its production. Secondly, Lightning Returns will definitely be completed quicker than its predecessors due to the nature of the Doomsday Clock. Many will finish their first save game of Lightning Returns between an estimated 13-26 hours, so replayability will be through multiple play through encouraging Square-Enix to include a plethora of side quests. Lightning will meet a "happy ending," as stated in an interview posted on Famitsu. Sadly that is all that can effectively be found concerning the upcoming conclusion to the Final Fantasy XIII trilogy. In my opinion this sequel will bring a heavily anticipated ending to the trilogy and I’m quite excited to see how this sequel will fold out. With the environment surrounding Novus Partus, one can expect reintroductions from old characters. With people ceasing to age, any character that didn’t explicitly die in Final Fantasy XIII-2 may reappear as NPCs in Lightning Returns. I also suspect that the Coliseum, an arena where players could fight special enemies in Final Fantasy XIII-2, may play a part in Lightning Returns. The Coliseum, simply put, is meant to play its role at the end of the world. Whether or not this will be an accessible location from the start of the game of not is up to Square-Enix, but I hope it is not a downloadable content location. Also the fact that Lightning is appearing 13 days before Doomsday, as she had done unknowingly in the first 13 days of the Final Fantasy XIII trilogy, is amazing in itself. How she will change Novus Partus will irrevocably be stellar. Mind you that there is to be one ending to the game, unfortunately, but hopefully Square-Enix makes it a great one. What is your opinion towards Lightning Returns? Zelkaar and Feyfolken like this.